I was recently in Prague, Czech Republic at a new cafe. There were little toasties with spreads and toppings that looked super good, but I figured they must be fish, chicken, eggs or something I can’t eat. But no, much to my delight the barista informed me they were all VEGAN! My favorite one was the Tofu “No-Egg” Salad. My mom used to make this for us as kids and I never appreciated it (I would rather have Kraft Singles on a white bread grilled cheese like the rest of my friends). But after my pleasant experience in Prague, I decided to try my hand at making a Tofu “No-Egg” Salad! I love the crunchiness of the celery and nuts mixed with the bite of cilantro and mustard. 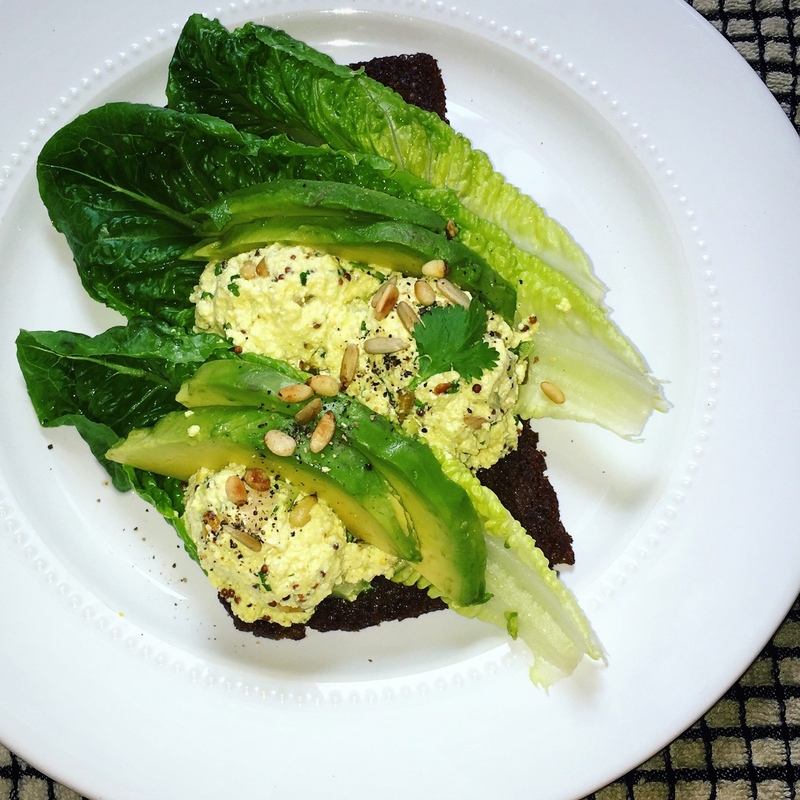 My Tofu “No-Egg” Salad is great on sandwiches or in a bowl of salad! I served mine with toasted Pumpernickel bread, romaine lettuce, and avocado. Enjoy! Rinse and drain your tofu and crumble in your hands into a mixing bowl. Finely chop the celery and cilantro and mince the shallot and garlic clove. Add to the bowl. Next mix in the Veganaise, mustard, vinegar, Bragg's, and lime. Start adding dashes of Turmeric until you reach your desired shade of yellow. Over high heat, quickly roast the sunflower seeds and pine nuts until they are just slightly browned on one side. Add to the bowl. Lastly, shake in the salt, pepper, and red pepper flakes to taste.